What 'rules' - things that get in the way of giving great care, and that stop ambulance staff doing their jobs well - could be broken? This was the focus of the fifth and final of the #ProjectA tweet chats. During a lively conversation, participants suggested innovations that could make the care that ambulance staff provide dramatically better, and the jobs that ambulance staff do significantly easier. You can read more in the summary report. 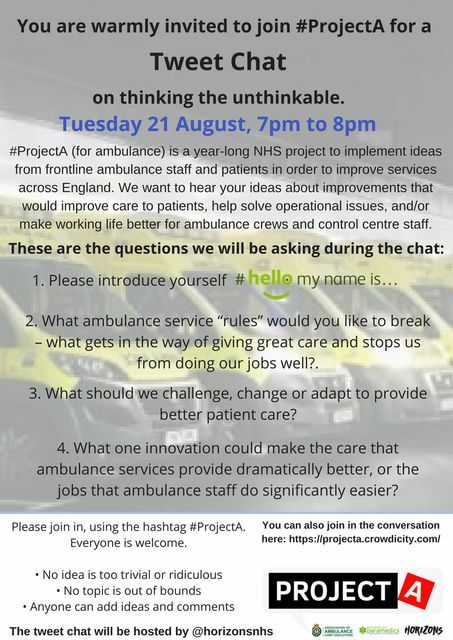 The previous four tweet chats were: partnerships with patients and the public; patient pathways; wellbeing; and working together across urgent and emergency care. The ideas platform is open until 3 September 2018. Hundreds of brilliant, innovative ideas have already been posted - if you haven't yet joined in please do - no idea is too small, or too daft! After the ideas platform has closed, a group of people and critical friends drawn from the ambulance service, partner organisations and the public will be looking at the hundreds of ideas and collate a ‘long list’ of ideas. This long list will then be ready for testing by frontline colleagues through an ‘Innovation Burst’ on 26 and 27 September. Keep an eye out for future news using #ProjectA. @horizonsnhs #ProjectA A3 we should challenge inappropriate use of services should that be by patients or other healthcare professionals. Just because someone is unwell, doesn’t mean they need an ambulance.